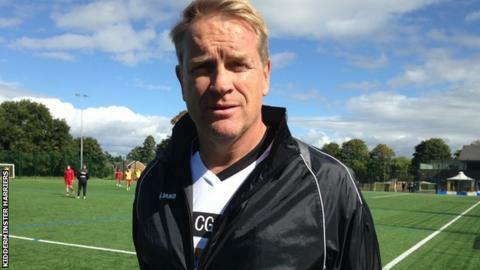 Kidderminster Harriers football development director Colin Gordon has become majority shareholder at the struggling National League club. The 52-year-old Worcestershire-based football agent has bought shares from the club's three largest shareholders - Neil Savery, Jane Murrant and Barry Norgrove - for "a nominal amount". Gordon gives up his role as an agent to comply with Football Association rules. Rod Brown, who became chairman in April, will continue to head the board. Brown told BBC Hereford & Worcester on Friday that the club were "in danger of becoming the next Hereford United" and needed up to £300,000 to see out the season. But Gordon's purchase of the shares has secured the club sufficient revenue to ensure that will not happen. Harriers' first win of the season lifts them off the bottom of the National League above Halifax. It was only their second win this year at Aggborough, their first in 20 league and cup games - a week after being knocked out of the FA Cup by neighbours Stourbridge. Coming on top of Saturday's 1-0 win home win over Woking, Harriers' first league victory in 19 attempts this season, it indicates happier times ahead at Aggborough. "Myself and Rod have a very clear vision of the future," said Gordon. "Essentially the club needs to become self-sufficient. "Over a large period of time, it is clear that our supporters have been asked, time and time again, to give their money and time in support of the club's ambition to chase the dream on the field - while the club has not been in a position to sustain any such thing. "We believe that, on and off the field, this club is one that needs to regain its identity and regain the support of its fan base. We have to become a club no longer dependant on the results on a Saturday afternoon or the receipts through the gate. This club hasn't been able to survive purely on those things for many years. Now the club has a future." Harriers signings since mid-September . . .
Much-travelled ex-Harriers striker Gordon returned to his old club in April to join the board in a newly-created role of football development director. He then spent four games in charge of the team following the dismissal of manager Gary Whild on 21 September, during which he oversaw two draws and two narrow defeats, prior to the appointment of Dave Hockaday as head coach on 9 October. Gordon has also engineered a string of new arrivals at Aggborough, having satisfied the FA that he is working within their rules, in an attempt to ensure that the club remain at English football's fifth tier. "We're working all hours with all the contacts and knowledge we have," he said. "To ensure we can get ourselves out of the situation we're in and remain a National League club."